Samoan born and raised, Michael Levin Sesega (Levi) is the musical architect and songwriter for the ‘Lights On’ project. Levi assigns musical movements which lead the listener through sincere and dramatic emotions. This has resulted in many repeat performances across Auckland’s live music scene, where listeners can be immersed in the feeling of oneness between themselves and the music. Think of a harmonious, classical twist on folk music with a very gentle infusion of rock. Now add a songsmith who is capable of profound story telling. Combine these elements and you glimpse the genuine nature of this genre-spanning ensemble. Levi’s charismatic and captivating stage presence is somewhat juxtaposed to his intensely private and reserved off-stage nature, which makes him a rather mysterious and alluring character. In the midst of all this, however, he harnesses to great effect his beautiful poetic imagery, brought about as a young teen in Samoa. The music is guided by the hugely talented Timothy Shacklock on cello, Andrew Miller on saxophone and Igor Shnayderman on cajon. With Jason Slade and Michael Sesega each on acoustic guitar and vocals, this makes for a well-crafted show of original tunes which will entertain people from all walks of life. Avid fans of this 5-piece line up describe the music as ‘powerful, emotive, intriguing and evoking self-reflective thoughts’. This is the stuff that keeps you on the edge of your seat and leaves you eager to hear more! 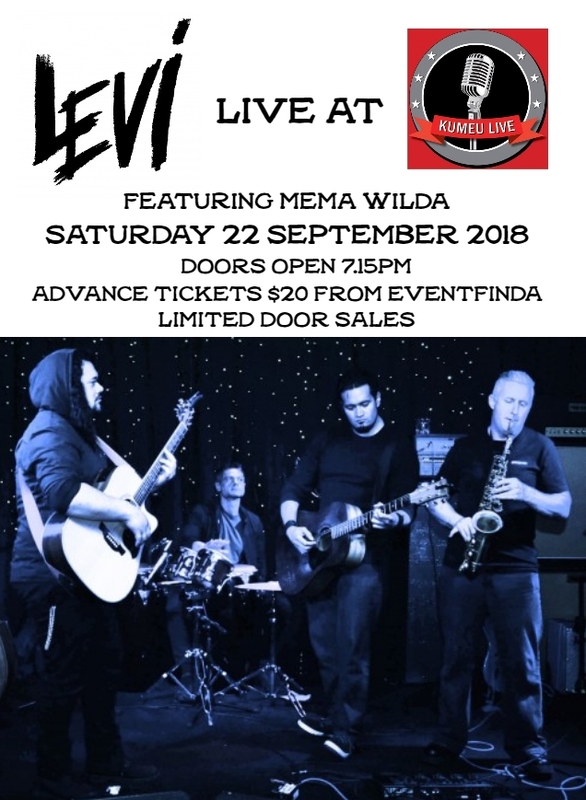 Levi is joined by Mema Wilda who draws inspiration for her music directly from her own personal experience of love, positivity, dreams, fear, Mother Nature and all the other emotions and journeys we all encounter as humans. This is what makes her music so relatable to each and every one of us. Mema has an ever-growing catalog of original songs which will captivate you and leave you wanting to hear more. Her beautiful melodies will leave you soaring and her touching lyrics will capture your heart. Mema's voice is simply stunning and she delivers every song with such passion and conviction that you will be totally mesmerised. This star is definitely on the rise so catch her now while you still can!